Notes: This is a relatively new microdistillery in West Virginia. They use corn, wheat and barley in a bourbon mashbill (recipe) as a base and rather than age it, bottle it directly to preserve the full on white whiskey taste. They use a copper potstill and are located on a limestone shelf – two prerequisites for excellent distilling. Made in a small hybrid column/pot still (a Christian Karl Copper pot still for those who are into details) and handcrafting each batch the small scale production and attention to detail show you what is possible if you have the skills and dedication. Their other products include: Whitewater Vodka (which uses a bourbon mashbill (to give it more complexity/depth) and Greenbrier (an American dry gin). They are also planning a brandy release for April of 2011. First Impression: Unmistakably corn whiskey. Nicely fragrant corn smell, sweet and full of promise. Cornbread lots of butter springs to mind. Taste: Sweet, smooth start, round mouthfeel to it. Not the cutting thinness wheat can have, but a full corn mash with caramelized sugar notes balanced with grain and a little spicy barley to leaven the taste and lend some spice. Slight drying and tingling at midpoint with slightly salty notes. Finish is medium, smooth and pleasant. Not as sweet as the Buffalo Trace White Dog I remember from Tales of the Cocktail this year – but I actually prefer the dryness of this spirit- conveys the corn nicely along with the grain of the barley. Drinks: A Manhattan (a perfect – which uses 1/2 oz red & 1/2 oz white vermouth with 3-4 oz whiskey and angostura bitters) was delightful if a trifle light in my opinion. On the other hand it is absolutely packed with flavor compared to a vodka martini swapping out the Smooth Ambler for vodka. It was golden corn yellow and tasted like the drink was lightly dusted with corn meal. Old Fashioned and vodka sour comparison was much the same. Both drinks were exceptional and came out well. While lighter and slightly less complex than a aged rye or bourbon – it has a brightness of fresh made spirit that you do not find in a wood aged spirit. 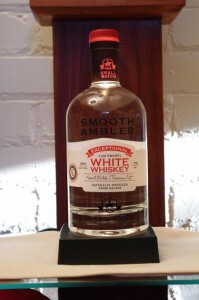 We also found the this white whiskey worked well paired with meat or fish. Bottle: Short clear glass bottle with rounded shoulders shows the whiskey to excellent effect. Nice heft to the bottle and a good grade of clear glass with nice decanter base so it is solid and hard to knock over. Name and trademark are silkscreened directly on label. 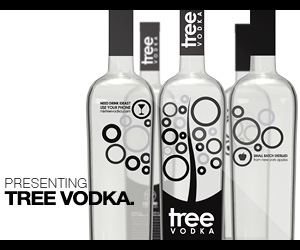 Wrap around paper label with simple graphics makes for a distinctive but uncluttered look. Also lists handwritten batch and bottle numbers. Red and black neckwrap with composite cork closure (what it lacks in character it makes up for in sealing). Final Thoughts: A outstanding corn whiskey that is 1/2 the cost of some of the competition and a excellent product on its own merits. Full of flavor and mixing potential. One suggestion is to use it to get those damned vodka drinkers to try something with some taste. 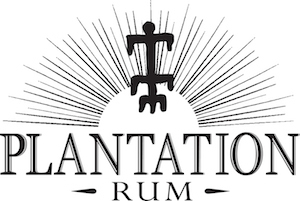 It is light yet flavorful and a excellent introduction to other spirits as peoples taste evolve past colorless, flavorless, (not to say spineless), fear of flavor concoctions.